Do you want to wear a big ant on your chest? The first Darwin Report T-Shirt is available at CafePress. 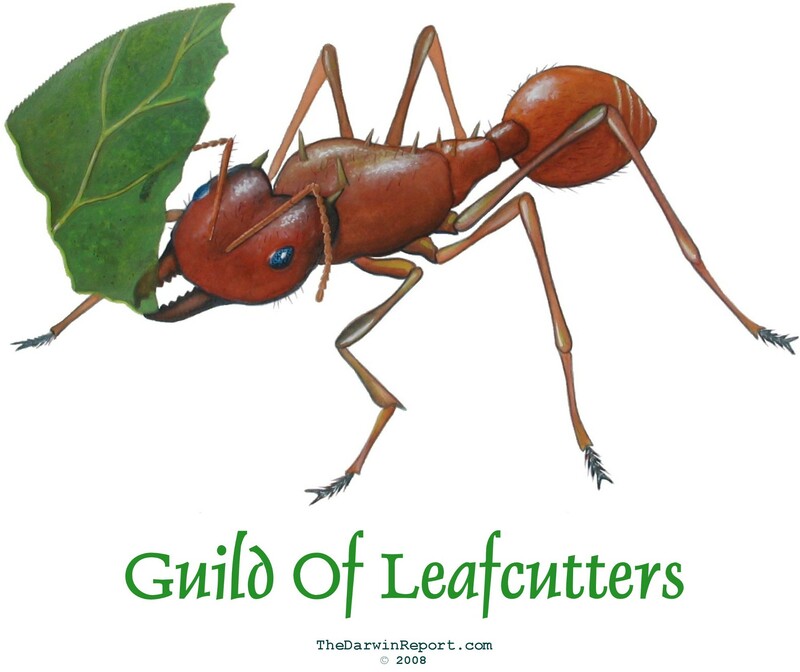 One of the greatest, most fascinating, invertebrate animals in the world has to be the Leafcutter Ant. There are about 40 species of this social insect and all of them make their living by growing a fungus (their food) on the chewed-up remains of leaves, which they diligently harvest. When I was 12 years old, I visited one of the pyramids in Mexico’s Yucatan Peninsula. And on the grassy field surrounding the pyramid, I spotted a long narrow path cut through the grass; it was only three or four inches wide. Curious I walked toward the strange sight and saw what appeared to be a fleet of tiny green sails traveling along the path like boats on a river. Upon closer inspection I saw that the green sails were actually sections of cut leaves, which were being carried along by a streaming army of ants. It’s one of my favorite childhood memories. These robotic fish can organize themselves into a school. This type of research touches on the study of emergent behavior and self-organization. Ants, for example, don’t consciously decide how they will perform their work. Each individual ant has basic programmed behaviors. But when ants interact as a group, behaviors emerge that aren’t inherent in the individual ants. Only as a groups do they truly shine. As a society, ants are more than the sum of their parts. A great book on the subject of self-organization is Artificial Life by Steven Levy. Dissect any creationist’s arguments and you’ll eventually uncover a belief in a worldwide Darwinian conspiracy. Scientists everywhere are hiding the truth of creation and teaching evolution as part of a vague shadowy plot to destroy religion and to corrupt the world’s youth with liberal ideas. Why should scientists do this? Is it for that sweet professorship level income? Is it to be in the presence of mobs of grateful undergraduate students? Or are all scientists radicals? A better question is do scientists get along well enough to concoct a conspiracy? I’ve just finished reading The Earth Dwellers: Adventures in The Land Of Ants by Erich Hoyt. And featured in this book is entomologist Edward O. Wilson, who’s famous for creating the sub-field called sociobiology. One of the implications of sociobiology is that human behavior is partly genetic. Unfortunately, some people erroneously saw hints of social-Darwinism, racism, and sexism, in Wilson’s work. As a result, Wilson received nasty criticism and personal attacks not only from the public but from his colleagues at Harvard University. Two of his most vocal critics were fellow professors Stephen J. Gould and Richard C. Lewontin. Do you feel the love? Wilson found Watson the most unpleasant, scornful scientist he had ever met. Watson’s discovery [DNA structure] was so earth-shattering that he [Watson] became a “Caligula” who could do or say no wrong. In spite of Watson’s disdain, Wilson deeply admired the man’s accomplishment and even his sheer audacity. He credits Watson as his “brilliant enemy” or “adverse hero”. This is just one example of conflict amongst scientists. The history of science is fraught with nasty disagreements. What good scientist wouldn’t disagree with a colleague in order to gain personal glory? If the evidence and data indicate a contrary opinion, then that’s the path one must take? Wilson found Watson “unpleasant”, but he still admired the man’s work. It’s the work that counts, not loyalty and ideology. Of course, scientists are human, and like everyone they have their biases. But most of the time they have no misgivings about following the data wherever it leads. This is why a worldwide conspiracy to hide the “truth of creation” simply wouldn’t work. And this is why evolutionary science couldn’t be suppressed in the 19th century. We were all very disappointed with these DVDs. They were FULL of evolution. Too bad that the beautiful photography wasn’t just shown with descriptions of the the little critters. The evolution was throughout…couldn’t just skip a few spots. Just wanted to notify other Creationists. This would have been a four star if they had stuck to the biology of the insects rather than their “origin”. Really annoying if you don’t believe in the evolution theory. This is a BBC documentary. The BBC is British. In Britain we have no time for crack-pot ‘theories’ like creationism. You are a silly person. Thankfully, and judging by the other reviews, I don’t think all Americans are quite so silly. You review unfortunately says nothing about the content of this DVD. Perhaps if you would view it without preconceived notions, you might have learned more and given customers a more informative review. Oh my! Evolution, next you will tell me the earth is not flat, and the universe does not rotate around the Earth. I cannot help but make a sexist remark at this point; Debbie and Anna are probably some busybody, ultra-conservative, religious right, soccer moms, who protect their brats from life by filtering out reality. And they probably network with their own kind. It’s just a guess.